News and Opinion - Safer Spokane - Stabilize the oil. Cover the coal. A ballot push by activists in Spokane, Wash., to impose local regulations on trains carrying coal and oil through the city has spurred strong opposition from the rail industry. The Safer Spokane campaign turned in a petition this week to let voters decide whether to fine owners of rail cars carrying uncovered coal or oil that hasn’t been treated to reduce its flammability. The 5,200 signatures on the petition must be verified, and the Spokane City Council must agree to put the issue on the ballot (Energywire, May 23). But with twice as many signatures as required for making the ballot, campaigns for and against the measure have already begun. The stakes are high. Spokane is a critical juncture between Western coal mines, Bakken oil rigs and Pacific export terminals. The Association of American Railroads warned Spokane last month to abandon the measure. The trade group represents the railroads with lines in Spokane — BNSF Railway Co. and Union Pacific Railroad. “Enactment of a ban would accomplish nothing more than wasting public (and railroad) resources on litigation with a foregone conclusion,” Michael J. Rush, AAR’s senior vice president of safety and operations, wrote in a recent Spokane Spokesman-Review op-ed. The federal government has sweeping control over American railroads under laws enacted to keep trains rolling across local and state lines. The Interstate Commerce Commission Termination Act gives the Surface Transportation Board exclusive jurisdiction over trains, and the Hazardous Materials Transportation Act also grants federal pre-emption. That law was behind the Spokane City Council’s withdrawal of a rail ordinance last year. But Safer Spokane and city Councilman Breean Beggs pressed on, with concerns lingering less than a year after an oil train derailment and spill in Mosier, Ore. The new proposal focuses on the Federal Railroad Safety Act, which allows states to impose their own regulations until the federal government specifically addresses an issue, and the Commerce Clause of the U.S. Constitution that allows local governments to address local dangers. In Spokane, trains cross above interstate highways, run along and over the Spokane River, and close to hospitals and schools. Accidents are not unprecedented. In 1991, a train derailed over Interstate 90. “Transporting highly flammable oil trains over elevated railways that are covered with uncontained coal dust through the most densely populated locale between the Bakken oil fields and Interstate 5 and also adjacent to the sole source drinking water aquifer for over 200,000 individuals is an essentially local hazard for which the Secretary of Transportation has not yet implemented safety rules,” the petition states. The initiative would mandate that coal cars be covered and that oil be conditioned to reduce its volatility. Another key change is that the owner of the car — increasingly the oil or coal company, not the railroad — would be the one fined. According to the petition, costs associated with the requirements would not be an undue burden, but critics are unconvinced. “This is opening up the taxpayers of Spokane to a huge legal fight, one that will ultimately cost them tax dollars better used for other city services,” Spokane County Sheriff Ozzie Knezovich said. Railroads say they have invested heavily in safety and that derailments have trended downward, with less than 1 percent involving crude oil. Michael Cathcart, president of the business group Better Spokane, said environmental antagonism to fossil fuels, not safety, is motivating the initiative. Safer Spokane President Jim Lee said public safety, not environmental concerns, are paramount in the ballot push. He praised safety measures taken voluntarily by BNSF, such as adopting a 35 mph speed limit and increased track inspections, but he said his group’s measure is still needed. June 3 marked one year since the oil train wreck, spill and fire in the Columbia River Gorge town of Mosier, Oregon, a few hours down the train tracks from Spokane. Over the past year, far too little has changed to protect towns like Mosier and cities like Spokane from oil trains. At the same time, new oil train terminals, such as the Tesoro-Savage facility proposed in Vancouver, are poised to multiply the threat. Our water and land, our schools and businesses and the health and safety of our families and communities are at risk wherever oil trains run through town. 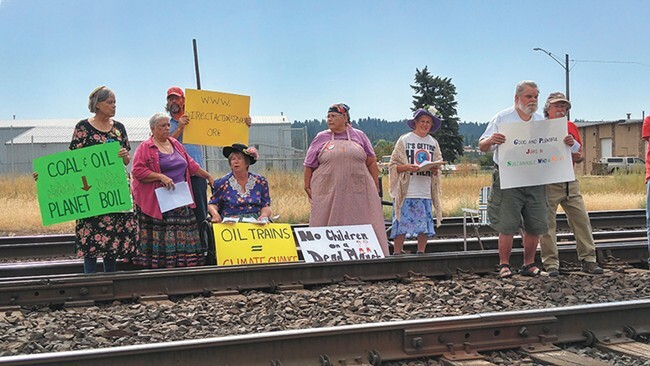 One year out from the near-disaster in Mosier, we call on our state and federal representatives to stop oil trains and reject oil train terminals so that it can never be repeated. In doing so we add our voice to more than a million public comments fighting coal and oil transport through the Northwest that were delivered to Gov. Jay Inslee in May. The groundwater near the train crash in Mosier, where about 47,000 gallons of oil spilled, is still contaminateddespite an ongoing cleanup effort. 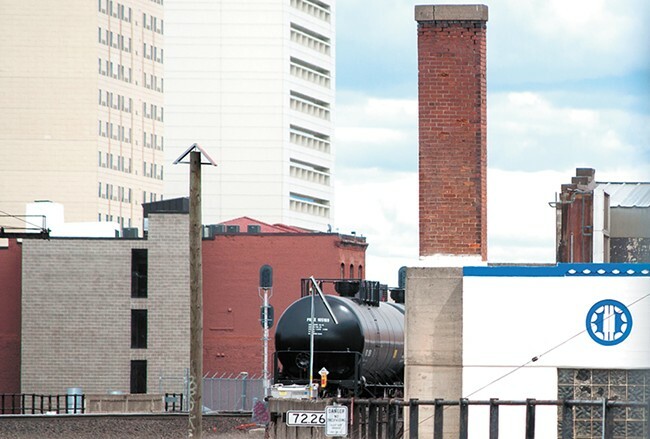 In Spokane, train tracks that carry crude oil traverse the city’s water supply. The Mosier spill resulted in the loss of more than 60 mature trees and temporarily “killed” our wastewater treatment plant. The plant was the hero of the day, capturing an estimated 25,000 gallons of crude, yet a sheen of oil still spread into the Columbia River. In Spokane, train bridges show signs of distress, and an oil train spill into the Spokane River would be a disaster for the city. Oil trains are a threat to public safety that cannot be fully mitigated. A few months after the derailment, Mosier Fire Chief Jim Appleton wrote in The Spokesman-Review that oil trains “should be declared unsafe and illegal,” because “we simply cannot handle the risk of oil by rail.” Even in the unlikely event that a derailment like Mosier never happens again, we are still vulnerable to pollution from coal and oil trains. The one-year anniversary of the oil train derailment in Mosier is a potent reminder that Spokane and all communities along the tracks are at risk. The derailment woke us up to exponential pressures of crude oil transport if proposed terminals are allowed in the Northwest and California. Spokane and the Columbia River Gorge National Scenic Area could be transformed into a superhighway for fossil fuel export. Gov. Inslee will soon decide whether the Tesoro Savage Corp. should receive permission to build the largest oil train terminal in the history of the United States. The facility would generate an additional five 100-car oil trains daily. The final hearing on air quality was Wednesday. The governor will be given a recommendation on the project. Elsewhere, all around us, oil corporations are still scavenging for sites to build oil export terminals. In Portland, Global Partners is seeking to acquire oil storage tanks, potentially for another oil storage facility, and the Canadian government recently gave the go-ahead to the Kinder Morgan pipeline, which would send oil tankers through the Puget Sound. But the people are fighting back. A new government in British Columbia was recently elected with a promise to fight Kinder Morgan, and the Portland City Council recently passed policies to prohibit bulk fossil fuel facilitiesand to go 100 percent renewable. We will not forget what happened in Mosier. We cannot let down our guard. As neighbors and Northwest cities and towns that value our health and our communities, we must band together to stop oil terminals and accelerate the transition to renewable energy. The technology is now available and worldwide investment has already shifted away from fossil fuels. We are poised in the Northwest to embrace and implement new sources of clean energy that are crucial for the future of not only our communities but of life on the planet. It’s up to us to lead the way. Andy Van Hees is a Millwood city councilman. Arlene Burns is the mayor of Mosier, Oregon. Todd Eklof and Jim Lee, sponsors of Safer Spokane, say the measure’s benefits would reach beyond Spokane. One proposed ballot initiative that would put restrictions on oil and coal shipments via railroad through Spokane for public safety reasons is in the signature-gathering process, while another that sought to ban such shipments outright by codifying people’s right to a healthy climate has been withdrawn. Sponsors of the active initiative, dubbed Safer Spokane, say they’re confident they can gather the 2,585 valid signatures needed by the June 20 deadline to put the initiative on the Nov. 7 city ballot. The separate Healthy Climate initiative, which was sponsored by Spokane physician Dr. Gunnar Holmquist, was withdrawn due to differences in verbiage between the initial petition reviewed by the city clerk’s office and the petitions being circulated publicly. The Safer Spokane measure would require oil companies to reduce the risk of a catastrophic oil train explosion by removing most of the volatile natural gas components from Bakken crude prior to shipment. It also would require coal companies to cover coal shipments to reduce the risk of derailment. Meantime, Spokane hearing examiner Brian McGinn has determined that both initiatives are pre-empted by federal law. The hearing examiner’s findings are nonbinding. City Council President Ben Stuckart says the Council doesn’t have authority to bar an initiative from the ballot based on the hearing examiner’s findings. Stuckart says the Council added the hearing examiner step to the initiative process because sponsors of prior initiatives that were stricken down in court complained they weren’t forewarned that the initiatives wouldn’t pass legal muster. Spokane City Councilman Breean Beggs, who helped write the Safer Spokane initiative, disagrees with the hearing examiner’s conclusion on that initiative. Beggs says the hearing examiner review is meant for initiatives that are written by people who don’t have lawyers. The hearing examiner process, however, doesn’t provide opportunities for initiative sponsors to make any changes before the hearing examiner reaches conclusions. “The hearing examiner gives opinions but doesn’t hear from parties,” he says. Beggs is an attorney who was involved in national oil pipeline safety reform in connection with the death of three children in the June 10, 1999, Olympic Pipeline explosion near Bellingham. He says he probably has more experience dealing with oil transportation issues than the hearing examiner. “I’ve been involved in what localities can do and not do legally regarding the transport of oil,” he says. Like the hearing examiner, BNSF Railway Co. also sees the initiative as illegal and unenforceable, says Courtney Wallace, a Portland-based spokeswoman for the railroad. Wallace says railroads are federally regulated, and local initiatives that seek to regulate them violate the Constitution’s commerce clause. “We are obligated by federal law to move commodities,” she says. Wallace contends rail transport is the safest and most environmentally efficient way to move anything on land. “A train can haul a ton of freight 500 miles on a single gallon of diesel,” she says, adding that a double-stacked train can haul the equivalent of 280 truckloads of freight. Wallace says BNSF routes 15 to 17 oil trains a week through Spokane, each with 100 to 110 cars. Lee contends Bakken crude has a higher proportion of volatile natural gas components than most crude oil. “We’re specifically asking them to reduce volatility through a process called conditioning,” he says. “That should reduce the chance of a spill turning into a fire or explosion by close to 90 percent,”. He says refineries extract natural gas components from crude as one of the initial steps of the refining process. Another element of the initiative would require coal shippers to cover coal cars. “The main thrust of that is coal dust is slippery and increases the risk of derailment,” Lee says. Initiative co-sponsor Todd Eklof, a minister with the Unitarian Universalist Church, in Spokane, says that if the initiative is successful, it will have far-reaching effects. “A better way is simply through interacting with Union Pacific and BNSF and building relationships between our community and them to make sure the tracks are safe and well maintained,” Cathcart says. If the initiative passes, it won’t be enforceable, he claims, but the community will have to pay for litigation. Cathcart says the top priority for the community should be to grow and create jobs to make Spokane an attractive place for businesses of all sizes to flourish. “When we’re piddling around with issues that don’t have that priority, we’re losing to someone else who’s getting those jobs,” he says. Lee contends a provision of the National Railway Safety Act enables local and state governments to apply regulations where unique local conditions aren’t addressed by the Surface Transportation Board. “We maintain our unique local situation is elevated rails passing through a dense urban area,” he says. He contends such precedent was set by a 9th U.S. Circuit Court of Appeals decision that upheld a case in California in which the state enacted regulations regarding a dangerous downhill curve over a river. Lee also asserts, however, that the initiative doesn’t intend to regulate railroads directly. UPDATED: Thu., April 20, 2017, 10:40 p.m. 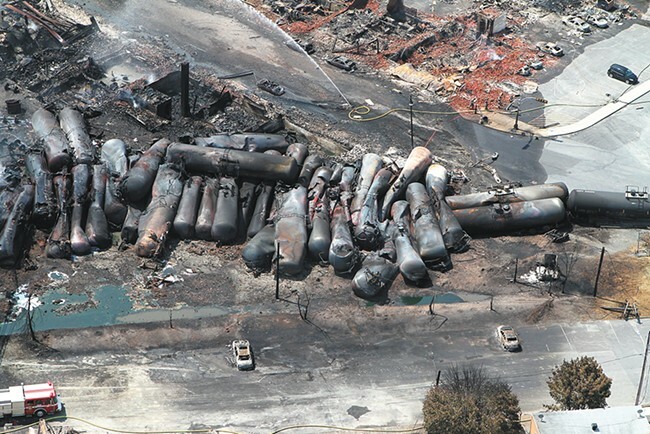 The 2013 Lac-Mégantic train derailment in Quebec killed 47 people. Every day, on average, nearly 200 tanker cars carry close to 6 million gallons of crude oil through Spokane. Each one of those cars can hold as much as three tanker trucks’ worth of some of the most explosive crude in the country. Spokane serves as a bottleneck into the state for trains traveling from the east across the northern U.S., largely from the Bakken oil fields in North Dakota. “Those [tracks] go straight through our infrastructure: our water, our Spokane River … the hospitals downtown, all of our business center,” says Spokane Fire Chief Brian Schaeffer. What if an oil train derails in downtown Spokane? What if a tanker filled with crude oil drops onto the buildings that shoulder the tracks, sending oil sloshing downhill toward First Avenue, bringing fire toward the Davenport Hotel and apartment buildings? What happens if oil spills into the Rathdrum Prairie Aquifer — the sole drinking water source for half a million people in Eastern Washington and North Idaho? Instead they’d focus on containing the fire and evacuating as many people as they could. Just a single oil tanker car on fire could force businesses, schools and hospitals within a half-mile to be evacuated. Spokane City Councilwoman Lori Kinnear attended one of the “What if?” simulations that considered the possibility of an oil train carrying Bakken crude derailing over Latah Creek or downtown. Where do you bring the injured, if both downtown hospitals are close enough to the fire that they need to be evacuated? Local activists and politicians have scrambled to prevent the worst-case scenarios — like the deadly train derailment and explosions in Quebec in 2013 — from happening here: They’ve launched ballot initiatives, petitioned the state and federal governments, and fought for higher safety standards. They’ve opposed construction of new oil terminals that would bring even more oil trains through Spokane. Some have even been handcuffed standing in front of the tracks to block the trains entirely. But for now, with the law largely stacked against them, their chances of success look bleak. The Lac-Mégantic derailment in Quebec destroyed more than 30 buildings. Image by image, at a Spokane City Council meeting last July, Council President Ben Stuckart lays out the stakes. In the council chambers, he shows a slide of piled-up tankers and billowing clouds of black smoke in Aliceville, Alabama. Then he shows a building-sized fireball rising into the air in Casselton, North Dakota. A tanker sticks out of the James River in Lynchburg, Virginia, still on fire. Firehose streams are dwarfed by the smoke and flames billowing from charred tank cars scattered in Lac-Mégantic, Quebec. 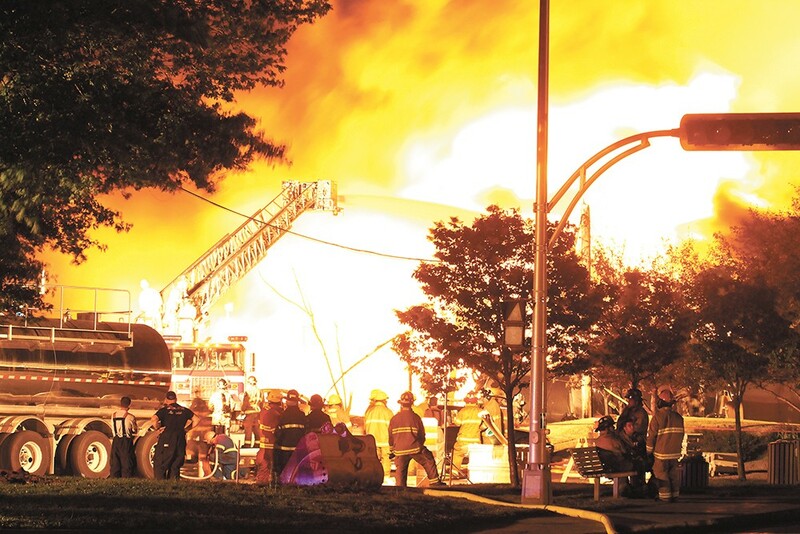 The fire demolished the downtown and made its way into the sewer system, funneling flames through the small town’s pipe network. Finally, Stuckart shows Mosier, Oregon. Only hours after passing through Spokane, 16 tanker cars derailed, spilling 47,000 gallons of oil that soaked into the ground, ignited and melted part of the town’s sewer system. “All the fire department could do is sit and wait for it to go out, for 10 hours,” Stuckart says. Had the winds been worse, the fire chief said later, the entire town could have been destroyed. For years, Stuckart, Mayor David Condon and other local officials raised concerns about the safety of coal and oil trains with railroad companies and regulators. But a ballot initiative proposed last July was the first direct attempt to fight the problem locally. The initiative wouldn’t have flat-out banned oil or coal trains. Instead, it would have fined train companies $261 for each uncovered coal car or higher-pressure oil car that passed through Spokane. Early last year, City Councilman Breean Beggs says, environmental activists concerned about climate change approached him, urging him to do something to address oil and coal trains. But Beggs says the initiative he finally developed wasn’t an attempt to fight global warming. It was intended to prevent disaster. All oil producers had to do to avoid fines was build the infrastructure to treat oil before transporting it on the train. Remove the lighter gases that may make the oil more explosive. Reduce the pressure in the tank cars to below 8 pounds per square inch or raise the flash point of the oil above 73 degrees Fahrenheit, and they’d be legal, under the proposal. A coal train derailment, of course, doesn’t pose anywhere near the environmental or explosive risk as an oil train. But Beggs justifies the demand that coal trains be covered with another concern — one the railroads themselves have raised: coal dust can cause derailments. If enough coal dust builds up on the track bed, water can’t drain properly, which can push the rails out of alignment and cause wrecks. While some city councilmembers hedged their support with concerns about the initiative’s legality, Stuckart focused on the moral necessity of addressing the danger that faced his city. With conservative councilman Mike Fagan absent, every other councilmember agreed to put the initiative to the voters in November. “Going to the ballot!” Stuckart proclaimed last July, pounding his gavel. But ultimately it never went to the ballot, and Stuckart was one of the reasons why. Three weeks after Stuckart’s impassioned speech about taking a stand, he moved to pull the initiative. The sudden reversal highlighted just how stacked federal law is against cities trying to challenge railroads. Even before Stuckart changed his mind, the council had been warned about the legal problems. The council’s legal advisor, Brian McClatchey, had laid out the reasons why the initiative seemed doomed: the U.S. Constitution, the Federal Railroad Safety Act and the Interstate Commerce Commission Termination Act all handed the federal government broad power to regulate railroads. With rare exceptions, states and cities weren’t allowed to heap on additional regulations — and McClatchey concluded that Beggs’ initiative wasn’t one of those exceptions. In the weeks following Stuckart’s initial vote, the council president reread McClatchey’s analysis. He met with the city’s legal department. He contacted national environmental groups. He spoke with members of the Gonzaga Law Clinic, trying to find any justifying precedent. Stuckart came to the conclusion that he’d been wrong. But ultimately, other than Kinnear and Beggs, the council voted to take the initiative off the ballot. “Trying to locally affect a national issue is very difficult,” Stuckart says today. Now running for Congress, Stuckart suggests that he’d be better able to fight for this issue at a national level. An oil train car passes through downtown Spokane. A consultant hired by the city warned that the city’s elevated tracks could lead to a scenario where a train car full of explosive oil derails and lands on top of a building. Beggs hasn’t been willing to give up. He’d gone toe to toe with oil companies before. Nearly two decades ago, he’d been a lawyer in Bellingham, representing the family of a kid who’d died when the Olympic oil pipeline exploded under a city park in June 1999. Eventually, the explosion, which killed two other youths, led to major new pipeline safety regulations. So, in Spokane, he’s forged ahead, revising the initiative’s language slightly to fine the owners of the oil and coal train cars, instead of the railroads directly. Then he handed off the baton to Todd Eklof, a Unitarian Universalist minister and one of the activists who’d urged Beggs to fight the trains in the first place. Instead of relying on city leaders, Eklof has sought to gather voter signatures and get the initiative on the ballot without the council’s help. Already, Eklof’s team has gathered more than the 2,585 signatures required (by June 12) to put the initiative on the ballot. “We hope to double it,” he says. But then Eklof has to whip up enough support to pass it. Today, even Stuckart, for all of his years lobbying for stricter oil train standards, says he hasn’t decided if he’ll vote for the new initiative. Meanwhile, Spokane County Sheriff Ozzie Knezovich has emerged as a fervent opponent of Beggs’ initiative. Four generations of Knezovich’s family mined coal. “I’m watching their way of life being destroyed by nonsense,” he said at a pro-Trump rally in Spokane Valley in March. When he sees coal — a non-explosive substance — lumped in with oil, he suspects that the motivations of the initiative’s backers aren’t entirely pure. He argues that the initiative would lead to chaos if it managed to get past the court. Eklof dismisses Knezovich’s argument, noting that apples don’t qualify as a safety hazard. But Knezovich, directly contradicting the testimony of Spokane firefighters, argues that Spokane has the capacity to respond to an oil train derailment. He argues that, considering the sheer quantity of oil being transmitted, it’s relatively safe. There are also deadlier tanker cars than those in oil trains rumbling across the tracks, he argues. While chlorine tank cars are a lot less common than those carrying oil, a single chlorine train car accident in Graniteville, South Carolina, in 2005 killed nine people and injured hundreds. Burlington Northern Santa Fe spokeswoman Courtney Wallace, at a press conference with Knezovich, points to the extensive safety improvements that BNSF has made. Today, coal trains are sprayed with a substance to tamp down coal dust, reducing the amount that blows off in transit. (It is unclear if the coal dust that still does escape is enough to increase the risk of an accident in the Spokane region.) The tracks are constantly inspected, with the naked eye, aerial drones and specialized rail cars, for flaws that could lead to derailment. Yet even with all these inspections, derailments can still occur. In March, a mudslide knocked a Union Pacific grain train off the tracks in Idaho’s Boundary County. And just this Monday, 25 BNSF train cars full of corn derailed off a track north of Sandpoint. But in recent years, the railroad has pressed tanker car owners to switch to safer models that have shields on the ends, better protection for valves and thicker shells. BNSF doesn’t allow the older cars to carry crude oil at all, Wallace says. Oil train disasters have still occurred with the safer cars, but Wallace says that BNSF has worked with Spokane and other cities to help them prepare for the worst. The Washington State Legislature passed the Oil Transportation Safety Act in 2015, establishing rules that require advance notice of oil shipments by rail and evidence that railroads could immediately respond to a spill. Response plans, which must be updated regularly, are also required under the act. Today, Spokane is more prepared. “Looking at the geography of the city, especially in the case of a disaster involving the tracks, it does have the potential to split the city in two,” says Schaeffer, the fire chief. So the department has placed hazmat resources and staff on either side of the tracks and freeway. Spokane also will upgrade its alert system, allowing emergency planners to draw a polygon on a map and send text messages, pinging off cell towers, to everyone in that area, says Ed Lewis, deputy director of Greater Spokane Emergency Management. Marler, with the firefighters’ union, gives the railroad credit for some of its efforts, but says they still haven’t solved the real problem. North Dakota already requires tank car owners to make sure that oil is below 13.7 pounds per square inch before it can move through the state. The oil is heat-treated to remove some lighter gases. But getting that Bakken oil pressure down below the 8 psi required by Beggs’ initiative? Kari Cutting, vice-president of the North Dakota Petroleum Council, estimates it would take hundreds of millions — if not billions — of dollars to build the infrastructure necessary to extract the natural gas from the oil and reduce the pressure. Cutting argues that we shouldn’t even be talking about the vapor pressure question until research is completed at Sandia National Laboratories to determine how much vapor pressure contributes to the flammability of crude oil. “I’m just not sure that even having a discussion of reducing vapor pressure is accomplishing much,” she says. Eventually, new regulations may be inevitable. Since last fall, the federal Pipeline and Hazardous Materials Safety Administration has considered whether shippers should be required to make sure oil cars have a pressure below 9 psi. In the meantime, Spokane’s anti-oil-train initiative sets the stage for an inevitable legal battle, the city of Spokane pitted against the railroads and oil companies. “We think these initiatives are unconstitutional and we will protect our rights,” BNSF’s Wallace says. The city of Spokane’s Hearing Examiner has concluded that Beggs’ initiative is so clearly in violation of federal law that it is beyond repair. But Beggs believes there’s a small legal space that Spokane may be able to slip through. Federal law allows states and municipalities to introduce additional rail safety regulations to address “essentially local” safety hazards, as long as they’re not already covered by federal law or overly burdensome to interstate commerce. Beggs argues that the safety hazard in Spokane is unique — the oil trains are passing through downtown on elevated tracks, above an aquifer that’s the sole source of Spokane’s drinking water. Beggs says he thinks that many of his constituents would be willing for the city to take on the legal risk if it meant decreasing the more explosive risk. 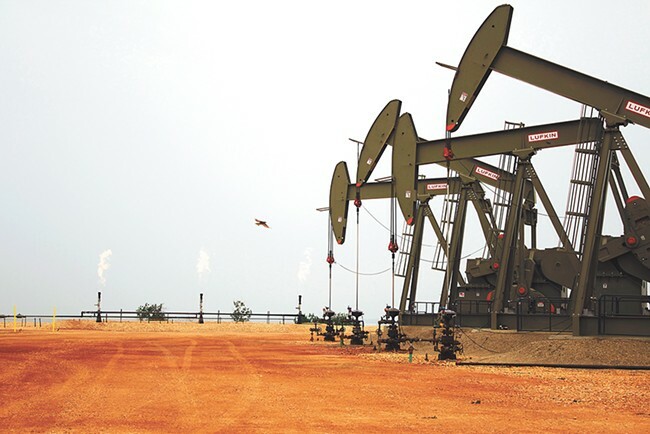 When it became feasible to extract oil from North Dakota’s Bakken fields, the flood of domestic crude helped to destabilize the world market while gas prices plunged. The Inlander asked representatives from both Union Pacific and BNSF if there was anything the city of Spokane could do, legally, to reduce the number of oil trains. The answer was the same: Essentially nothing. In fact, even a huge decrease in oil consumption in the Inland Northwest would be unlikely to impact Bakken oil train traffic, says Robert McNally, author of Crude Volatility: The History and the Future of Boom-Bust Oil Prices. The United States would probably eliminate oil exports from Nigeria and Libya from its diet before cutting out domestic Bakken oil. Instead, one of the biggest ways that Bakken oil train traffic might be reduced is due to another project that environmentalists — and the Spokane City Council — fervently opposed: the Dakota Access Pipeline. While the pipeline’s course through tribal land made it a flash point for protests, it’s ultimately cheaper and safer to funnel oil through pipeline than by train. As pipeline infrastructure has built up near the Bakken oil fields, the amount of Bakken crude transported by oil train has already fallen dramatically. And with the Dakota Access Pipeline able to take half of the approximately 1 million barrels a day the Bakken oil fields generate, experts expect much of the oil-by-rail traffic from the Bakken to disappear. Yet Spokane may be an exception. Oil terminals and refineries in the Pacific Northwest generally lack pipeline access to Bakken crude — and the Rocky Mountains would make pipeline construction untenable. So for oil opponents in the region, the latest battleground has become the proposed Tesoro Savage Vancouver Energy crude oil terminal. Since 2013, activists and municipalities have been fighting against the plan for the facility. It would be the largest oil-by-rail unloading terminal in the U.S., and it would mean four more oil trains, every single day, coming through Spokane. The city of Spokane has thrust itself into the terminal debate. It sent a comment to the state warning of “a potentially catastrophic incident” that would be “crippling to the public’s sole source of drinking water.” It also hired hazardous materials consultant Michael Hildebrand to detail the “extreme challenges” that would occur as emergency services scrambled to address an oil train derailment. Ultimately, it will be up to Jay Inslee, a governor who’s prided himself on his efforts to combat climate change, to decide whether to approve the terminal. For now, the deadline is June 30, less than two months away. If all legal methods are exhausted, of course, activists have another option: illegal methods. It’s a sunny August day, and Nancy Nelson, in her old-fashioned indigo dress patterned with pink and white flowers, stands on the railroad tracks east of downtown. She’s wearing her dusty-green apron, with pictures of two of her grandchildren on it, as she’s arrested. She says she wants her grandchildren to grow up in a healthy world. They have asthma, and she wants to them to grow up to breathe easy. Two other “Raging Grannies” — members of the international organization of elderly female radicals — stand with her and get arrested. They’d get the score from the railroad later: Blocking the tracks for an hour, they delayed the passage of 11 oil or coal trains. It’s not the first time Nelson’s done something like this: 32 years ago, she stood on railroad tracks to block an armored white train that she believed was carrying nuclear warheads. “I felt like I had to put my body in front of that train that carried enough nuclear explosives to blow the entire world up two-and-a-half times,” Nelson says. She feels the same way today. A month after the Raging Grannies protest, the tracks are blocked again, this time by three members of the Veterans for Peace organization. They are arrested too. “I don’t think it’s too strong a word to use: ‘Mass suicide,'” George Taylor, a 77-year-old local Lutheran pastor, says about the threat of climate change. Three “Raging Grannies” were arrested after blocking the tracks last year, a protest that local activists hope will lead to a wave of more civil disobedience. Nelson, Taylor and other members of the local Direct Action Spokane group gather in a coffee shop a short block from the railroad tracks in Spokane. Most of them have broken the law. Eric Christianson, their criminal defense attorney, reminds them that merely by discussing the events, they could be implicating themselves. “What we realized was that Spokane is a bottleneck for the traffic of carbon,” says Gunnar Holmquist, a local doctor and member of Direct Action Spokane. Block the oil or coal trains here, and you cut off much of the Pacific Northwest. Direct Action Spokane members expect to vote for Beggs’ initiative, but they don’t expect it to survive a legal challenge. They also see it as largely missing the point. You can treat the oil and cover the coal, but it’s still dangerous to the climate, they say. Direct Action Spokane proposed its own, far more radical initiative — it would have barred local law enforcement from arresting protesters who block the track at all — but pulled it to avoid confusion with Beggs’ initiative. For now, they focus on breaking the law in an attempt to change it. On May 19, the six arrested activists will face a hearing. Their hope is that they’ll be able to use the “necessity defense” and argue that, yes, they broke the law, but only because they did so to prevent a greater harm from happening. Looking at the legal landscape, they find reasons for optimism. Last year, a U.S. District Court judge in Oregon ruled that a group of children and young adults had standing to sue to protect the climate. “That’s a crack in the legal system that can be expanded; it’s whole new territory for the law,” Holmquist says. But even if they don’t prevail legally, the protesters hope they will change minds. It won’t just be a few old people standing on the tracks. Others will join them, across the country. Many will be arrested, sure, but maybe some juries will refuse to convict them.